The principle theme that links the first pair of chapters in the collection relates to issues of personal ownership of curriculum knowledge. In ‘The Relevance of Creative Teaching’, the teachers studied by Jeffrey and Woods worked to interpret and present the curriculum in ways that were meaningful within their pupils’ frames of reference. They were in control of the pedagogic process and the adaptations they perceived necessary. From the point of view of their pupils, classroom tasks, thus mediated, became activities that engaged their emotions, interests and critical faculties. However, as Parker-Rees explains, the demands of a busy classroom life may sometimes trap teachers in a ‘curriculum delivery’ style of teaching. In ‘The Tale of a Task’, a teacher’s attempts to maintain the purity of curricular intentions conflicted with the intricacies of a real situation and a child’s understanding of the task. Loss of control of the pedagogic process and pupil evasion of the task followed. Subsequent pupil engagement and learning was inspired by the pupil’s play, rather than by the teacher’s conception of the task. Comparisons of pupils’ curriculum experience in these two chapters throw further light on an observation made by Jeffrey and Woods about the successful teachers they studied. Those teachers first made curriculum knowledge their own, so that pupils, in their turn, could make it their own. We have for some years been researching into what we describe as ‘creative teaching’. Woods (1990a) was impressed by his observations in a number of English primary schools in the 1980s by teachers’ powers of invention, which seemed applied to every aspect of their interaction with their pupils; by the way in which they ‘owned’ the knowledge they were conveying, in the sense that they were not simply fulfilling the requirements of others who had specified what should be taught; by the way in which they controlled their own pedagogical processes, varying them according to their own perception of need; and by being highly relevant, that is, operating within a broad range of accepted social values while being attuned to pupil identities and cultures. We have elaborated upon and illustrated the first three of these criteria in Woods (1993, 1995a) and Woods and Jeffrey (1996). 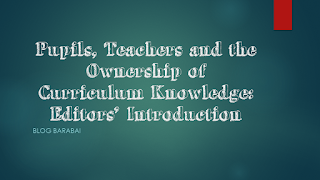 In the latter, we discussed the fourth, relevance, from the point of view of the teachers, showing how they worked to construct ‘relevant knowledge’, defined as knowledge that is meaningful within the child’s frame of reference. We described teachers’ strategies in sharing and creating knowledge, stimulating ‘possibility knowledge’ through imagination, utilizing children’s ‘prior knowledge’, and developing ‘common knowledge’ (Edwards and Mercer, 1987). In this article, we consider the pupils’ views on ‘relevance’. The questions we are concerned with are: What effect does creative teaching have on pupils? How does it affect their feelings, motivation to learn, behaviour, learning, relationships? How do pupils perceive such teachers, or such teaching? This, therefore, is a test of the efficacy of such teaching, besides offering to tell us something of general importance about pupils. Relevance is also an issue of some political concern. Who decides what is, and what should be relevant, and to what? Chris Woodhead (1995), HM Chief Inspector of Schools in England, has criticized the belief that ‘education must be relevant to the immediate needs and interests of pupils’, and argues that ‘Our school curriculum must provide young people with the knowledge and skills they need to function effectively in adult working life’—a kind of relevance to society and to their own later life-chances. Some, however, see the first as a means to the second. Without it, Morrison (1989, p. 6), for example, feels that the ‘art of teaching is lost to a series of narrow skills’, becoming ‘the casualty in a bureaucratized view of education in which education is called into the service of wider political ends and ideologies’. Wragg (1995), for another, has urged the continuation of topic work and local projects, and space and time for teacher and pupil choice (see also Armstrong, 1992; Webb, 1993; Dadds, 1994). Pupils themselves have a great deal to contribute to this debate. Pupil perspectives are important because pupils are not just receivers or consumers of knowledge, but constructors of shared meanings in a combined exercise with teachers. Quicke (1992) has pointed out that these meanings are an aspect of ‘metacognition’—knowledge about learning processes, about strategies of learning, and about people who are involved with them, like teachers. We might include in this a host of factors, notably the emotional, which affect the whole character of the learning enterprise and pupils’ disposition towards it (Elbaz, 1992). If we are concerned to produce autonomous, critical and reflective learners, and to improve learning, we need to know what sense pupils are making of what is offered to them, and how they view and feel about the circumstances in which it is being offered. It might then be possible to improve the pupil’s metacognitive knowledge, and the context in which it is constructed. Without doubt, the teacher is one of the key, if not the key, elements in the development of metacognition. Consequently, there has been a certain amount of research on pupils’ perceptions of teachers and teaching. For pupils in general, in other countries as well as the UK, the most important attributes of ‘good’ teachers appear to be that they should be ‘human’, should be able to ‘teach’ and make you ‘work’, keep control and be ‘fair’ (see Woods, 1990b, for a summary of this work). However, even if a teacher successfully establishes all these conditions to the approval of pupils, it cannot be assumed that they make the same sort of sense of lessons as the teachers. It is not always realized how recondite the teacher’s lessons sometimes are, or what pupils understand by ‘work’ and learning’. Also, while pupil responses have been organized into categories, as above, there are issues to do with all of the categories, such as sensitivity, feelings and trust, which may be more important since they are generic. These issues may be related to creative teaching. Our central concern, therefore, is to expand on the notion of ‘relevance’ as it applies to creative teaching. But the analysis also bears on two related issues: (1) the nature of pupils’ metacognitive knowledge; and (2) pupil perspectives on ‘good’ teachers as they see them. Our sample is drawn from the five main schools of the creative teaching research. All five schools were state-maintained non-denominational schools, in mainly working-class areas of a large inner-city in the south of England. One of the schools has about 20–30 per cent of its intake from more professional white collar backgrounds. Most of our enquiry came to focus on seven main ‘key informant’ teachers (Woods and Jeffrey, 1996). The excerpts in this chapter come from five classes covering Years 2, 3, 5 and 6 (containing pupils aged seven, eight, ten and eleven respectively), representing 140 children and five teachers, and is selected from material collected over a period of two years. The method for this part of the research involved observation of teacher-pupil interaction, followed by discussion with pupils about the interaction observed. The pupils were from across the ability range. A number of ethnic groups were represented among them, the main ones being white English, Afro-Caribbean, Nigerian and Turkish. We considered the teachers a key group—in mid-career, experienced, well respected, generally regarded by their peers, pupils, parents and inspectors as successful, with management as well as teaching responsibilities, meeting our criteria of creative teachers as defined above, and very willing to collaborate in the research. All teachers are creative to some degree or other, certainly, but we would claim that these teachers have that quality in abundance. We have identified four areas of classroom life that seemed relevant to pupils, namely, responding to pupils’ emotions, engaging interest, maintaining individuality and developing educational evaluations. We shall consider each of the four areas in turn. In responding to, and handling, pupils’ emotions, these teachers covered a wide range of emotional situations. I liked it when she told us stories about when she was young. Like once, when she went into her sister’s bedroom and put her sister’s make-up on. She blamed it on her baby brother, pretending it was him. It wasn’t until her brother was 10 or 11 that she owned up and told her sister it was her. She gets excited when someone with a bad attitude problem comes on very well. When he’s on report or something she comes along and supports him. She listens to people and their problems…She’s good at dealing with depressed people. She’ll say, ‘Excuse me, are you depressed about something?’, then she’d relax you and talk to you personally. She’d just comfort you really…She enjoys people sitting down in circles and people talking about this and that and the other, about different feelings they have. When we’re angry, she knows how it feels and she makes us feel better and solves the problem, helps us. She takes it easy on us. She has told us stories of her being angry when she was young. Yes, it’s good, you can let everything out, ‘cos say you was angry, you just let out. Pupils are conscious that they have emotional connections to their teachers: ‘We want to make Grace [their teacher] happy’, and they appreciate the physical warmth, as Toxs (Year 3) notes, ‘She hugs us and she’s happy when we do good things’. When you get a piece of work wrong she doesn’t say, ‘No, that’s horrible, go and do it again’. She kind of explains it in a silly way that will make you go and do it again. She’s quite funny when she speaks in a silly way. She puts her hands on her hips and kind of pretends to be angry but she really is joking. She does make us do it again, but she is not furious. 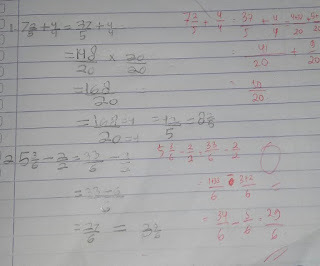 I think she’s good at maths because when most teachers tell us to do maths they don’t really explain it very well, but when Theresa [their teacher] asks us to do maths she really explains it well. She makes sure that we know what we’re doing before we do it. I like to write because at the end I know I have done something good. We race and wait for our friends [in the writing lessons]. When I finish a piece of work, I feel I’ve achieved something. Like, when I’d finished my map, I felt, like, it’s a whole block of work. I just thought, ‘Wow! That’s really good!’ If you look at it up on the wall you sort of say ‘That’s mine’. If you did it quite a long time ago, you can, if there’s something on your table that you’re just finishing and it’s something slightly like that on the wall, you can look at it and you can compare them to see if you’ve progressed. Just as pupils are aware of the emotional content of a classroom and its relation to their progress and achievement, so they are also aware of what engages their interest, and, more so, how their teachers work to engage that interest. Three methods of engaging interest are identified here by pupils: making things fun, providing curriculum support and being resourceful. We made these treasure maps. Theresa [their teacher] didn’t really tell us what to do. She just told us to make a grid and then make a treasure map, and we had to have instructions to find the treasure. They had to be really hard. We had to do the instructions on our own but we told each other things like, ‘Hey! look at that! That’s great!’. And sometimes we took ideas from other people if we couldn’t decide what to do. I thought it was fun. We did homework on it as well, so we worked on it quite a lot. It wasn’t like something which I’d look at and think, ‘Oh no! We’ve gotta do the treasure map! I wish I wasn’t in school today’. It was really exciting. You get to be different people and you can act out the events. It’s enjoyable because you can just go along with it, and it’s the way you do it that makes you enjoy it…I like being other people. There’s all the parents and everybody else and me being all these characters. I like having loads of parts. As we were coming down to the hall, all dressed up, I felt like I was a Tudor person. The way we had to walk made me feel like I was a Tudor person. When we were coming out of the hall, having done it, I still felt like a Tudor person. Everyone was looking at me as a Tudor person. When we got back into the classroom, I took all my clothes off and left on the ones I had underneath, and it felt like I wasn’t a Tudor no more. It just felt like I was me. I liked playing both parts, but when I was a Tudor person I missed being me, and when I’m me, I miss being a Tudor person. These reflective and seemingly existential observations are only a small part of the depths of understanding that pupils do achieve but often have little opportunity to explore in classrooms where these dialogues are not valued. Andrew (Year 6) loved his role playing, but he expressed it in a more detached way. What was I enjoying about being there? Oh, that’s a tricky one. Well I think it was making the audience laugh. I was being tortured, but when I stretched my legs out and everyone started laughing I thought, ‘Please don’t make myself laugh, please, please!’ I made it even funnier, but I was saying to myself, ‘I mustn’t laugh’, and I just kept my laugh in. I was tense. I was watching him and thinking, ‘Come on Wayne, come on Wayne!’ I thought he was going to run out of the hall. I felt really sorry for him. I felt like I was going to cry, too, for him. I was just saying, ‘Come on Wayne, you can do it!’ I felt like saying that, but I kept quiet and just kept thinking, ‘Come on Wayne!’ As I walked him back [after his song], I said, ‘Are you all right?’ and he said ‘Yes’. I said, ‘You was really good’, and he went, ‘Thanks’. The involvement of these particular pupils in this drama is probably a recognizable feature of many school drama productions resulting in the mutual support and togetherness feeling of ‘communitas’ (Woods, 1993). The opportunity to discuss the events with pupils later showed just how involved some of them had become and what it meant to them. You just get into it. I like finishing it. I like getting more done. I’m relieved to get it done and upset that I can’t do anymore. I’d get a scrap of paper and write it down and point out the child’s mistakes and show them the way. And make them change it…I wouldn’t give them the answer [laughingly]. I wouldn’t have a go at them if they got it wrong. Because they’re trying to learn. It’s not their fault if they try, and they put their mind to it and they couldn’t get the answer. I was with Simon. We were like a team, weren’t we Simon? We were writing and helping each other out by giving each other the answer, by saying, ‘No, that one is two twos equals four, add on one is five’. Like that, like a team. She’s [the teacher] good at maths because she doesn’t make it too hard for us. She does it the long way, and if you’re not sure, if you don’t know, then she gets you to sit on the mat and she’ll help you. It keeps on going like that and we get the answers right. It is significant that a number of children describe teachers as good at particular subjects when the teachers actively help them succeed at a task, rather than assessing teachers in terms of their depth of knowledge of the particular subject. They clearly value teachers’ pedagogic skills over subject knowledge. Instead of just saying ‘you work it out’, she gives me ideas. Like I can’t really end my stories. Most of them just go on and on, and I can’t normally find an ending and she helps me with that. For example, she suggested I write, ‘I had that spinning feeling again and I came out of my dream’. So that was one way to end my story. We need the time to do it in greater detail instead of in a rush. You can tell if something’s been rushed or done slowly. If we don’t know something, she explains it, and if we still don’t get it properly she tells us to go away and think about it. She doesn’t let you off doing it, because Richard had to write the invitation to the governors out eleven times until he got it right. When she’s talking to you she sort of understands you, and if you don’t understand it, she doesn’t give up like sometimes your mum and dad do. If you do work for them, they go, ‘Oh! I give up!’ But with Theresa, she carries on listening to you and carries on, even if it takes all day. Hera (Year 5), in analysing the same teacher’s role on the treasure island task, explains that ‘she expects us to use our brains’. Some pupils are particularly perceptive about the work of their teachers and admire their resourcefulness and imagination. Edda (Year 5) enjoys her maths Matrix provided by her teacher, Wendy. This is a collection of different maths activities that the children work through in turn. Wendy organizes it herself. Sometimes she puts computer games in it as well as maths games. It’s fun. I like to choose the easier ones first and leave the hard ones to the end. …likes doing time machines, maps and Tudor gardens. She does a lot of imaginative work like the Tudor gardens, a lot of finding out about different times, science and experimenting. She also tries out new things from books. She can do serious projects which are part of the National Curriculum, but she also likes to set up her things which she’d do at the weekend which we were grateful for and you have a laugh with—like doing little paintings or little origami lessons or something like that which is really good, which she’s not really supposed to do…But she’s got her own side. She doesn’t follow like a dog on a lead. She’s not forced to do anything. She’s not forced to get special lessons from outside the school. She puts herself out for us. I had mini ships, rocket boosters, beds in it and capsules with engines. We just came back to it each day, in all it took about seven days. All Theresa [their teacher] did was tell us what to do and just to go out there and do it. In the playground I was looking for sculptures and I found a bow that someone had made, so I decided to make a Red Indian. I used to go to a centre where they made puppets and I get a lot of ideas from them. I’ve made a lot of puppets. It’s going to have a band and feathers on it. I make a lot of toys at home. Any toys that are broken I take apart and build different parts together. I’m making a magic wand so I can produce lots of rabbits. The idea came from putting the sellotape on the Plasticine. It’s a theme on Australia: ‘A World, a boomerang and some corks on a hat’. Pupils also have perspectives on their preferred ways of working. When eight Year 5 pupils were asked about this, three categories were suggested: (1) independently ‘so no-one can disturb me’; (2) dependently, ‘chance to talk and share ideas’, and (3) interdependently, ‘working as a group I can talk to others and get ideas but nobody else can spoil my work’. This sophisticated analysis is based on their own experiences, and at the same time indicates the place of individuality in their classroom work. She [the teacher] talks to the whole group together and then we just tell her our ideas, and other people comment on them and suggest this and that and then we put it all together. She lets us talk about it more than other teachers. She lets us have our own conversations and arguments and then gets us back to the point. She lets us speak, she lets us vote although we’re not eighteen…She lets us breathe more. Most of all she listens, unlike other teachers who jump to conclusions. When we argue, people join in and everyone puts in an idea. Other people have ideas and different cultures. We learnt this from Marilyn [their teacher] because she made us sit with different people and we had to get on with them. It wasn’t that we didn’t like them it was because we didn’t know them. When we had arguments she talked to us and showed us we aren’t the only ones in the class. She taught us how to do what she was doing, like talk to us and sort out our problems. Now when we break up, we sit down and talk to each other. She also talks to the whole group together. We tell her our ideas and other people comment upon them. We discuss things. She gets her board out and says, ‘Let’s sort this out’. Lee said, ‘Why don’t we let Georgina or Milton read the poem because they know Jamaica and they’re Black’. I said, ‘Why? Because white people can read black poems too, just as I can read white poems.’ Marilyn said, ‘All right let’s discuss it,’ and I read it and Lee read it. We all had a go. Some teachers might have said to me, ‘Don’t be rude’. She tells us calmly, she’s always calm in our discussions. The interest pupils have in not being typecast or stereotyped is exemplified by this example. Pupil’s critical evaluations of curriculum and pedagogy were part of the life of many of these classrooms as these Year 6 pupils indicate in their reactions to an OFSTED inspection. I was worried that they might watch us undress because I would shrivel up with embarrassment. It was like people spying on you. I wouldn’t like an inspection every week because we could hardly breathe. I was nervous that they would look at my work and worried that they would think it was rubbish. We worked hard because we didn’t want to let the school down. These pupil perspectives give an indication of their use of rationality and show their ability to detach themselves from their involvement in order to appraise. Rational analysis often comes out through argument and discussion. Kayleigh and Rosa (Year 2) were talking about what helps them think when the former suggested that her teacher, Laura, prevented her from thinking. Rosa disagreed. You don’t have a chance to think when Laura’s talking and that’s the time when you can’t talk, and it’s not fair. ’Cos you want to think about something, but Laura says ‘Stop’. Rosa: But I think, when Laura’s talking, about what Laura’s saying. Yes, but that’s important when she answers the question, Rosa, but not when she asks the question, that’s what I mean. ’Cos I can’t carry on thinking because it disturbs me when I’m thinking, and when Laura’s talking to the whole class and you try to speak to her she says, ‘No, no, no’. Children from the same class also discussed a problem-solving lesson about graphs that had gone badly in that they could not understand the teacher’s instructions. Laura, the teacher, also thought she had not been very clear and eventually she told them how to do it. The debate that goes on between Leila and Rosa (Year 2) indicates that not only are opinions present, but are also evidence of an interest in pedagogic approaches. She should have told us what to do in the first place. I think she should have just sat and watched to see if we could do it properly, because some people might have known how to do it, they might have done it. You have to try, because you try first and see if you get it right. Child: I still think that she should have told us how to do it correctly so that we wouldn’t have used so much paper. When we went to Hampton Court we found the other side of the story really. We believed in one thing and it was not totally true. We thought that he [Henry VIII] just picked up his food, but he has to use these two fingers, and we thought that he picked up chicken legs and chucked it behind him. All the things that you’ve been told or you believe is rubbish. You have to wipe that out and listen to what they’ve got to say. …a good way how to learn history. You can’t actually remember all the dates but if they make it like fun, like this, it’s easier. I would like to learn about the cavemen times. I’d like to learn how they got their food, how they made their weapons, how they got there, how did the world begin and how did people form, ‘cos no-one would really know the truth about how people formed, no-one knows. The thing about Adam and Eve could just be a big fairytale. Wendy [the teacher] could have set up more things for us to do, like going out, going to see more people, getting more ideas off people who had actually been there. Well, when she’s not here, we miss her, because then we have to get all different teachers, we have to go to other classes and things get mucked up in the class and the day seems a bit longer when she’s away. People don’t behave properly when she’s away. We enjoy ourselves when she’s here because she makes things easier for us. She says it always should be quality. I think she expects us to be accurate because she says, ‘Now this might be a little bit easy but it has to be accurate, right’. Our teacher was different. She tried her best. She glared at us a lot rather than tell us off. She came round a lot and gave us clues, patted our heads and marked our work a lot. Annoyance came through her eyes and her smile. Some of the teachers got angry with us because they were tired with too much work to do. I saw her with her head in her hands, and when I asked what the matter was, she said she was so tired. Our headteacher apologized to us later for shouting. He thought we were going to mess up the inspectors’ room. There’s normally lots of humour and she got angry about a broken thermometer, when she wouldn’t have done normally. The had power, but when the inspector came in they asked her questions, and when they left the power faded, and when they returned so did the power. These rational observations and perceptions are complemented by highlighting one of the sophisticated ways in which pupils are able to carry out these evaluations; by role detachment. Here, today, for there was too much politeness in the Tudor court, too many manners you had to obey, and more chance of being beheaded if you did things wrong. There’s more technology today and it’s more realistic. I thought it was fun. It was good because it teaches you how to dance and takes you back to Tudor times and shows you how to dance… and to compare how we dance now and how they danced a long time ago. Other people tell us, children have heard about it, we’ve rehearsed it, we know it well and we have seen other plays in the past to compare it with. You try really hard and sometimes you get out of breath. You’d know that we were concentrating by the way we’ve done the costumes. If we hadn’t worked hard bits would be falling off. She would know if we were rushing it. Laura [their teacher] would know ’cos we usually do it neatly. When we talk too much she thinks that we haven’t worked hard enough. Even at the age of 7, Emma, in discussion with her friends, was able to detach herself from her work and evaluate how it is possible to show how someone has worked hard. They decided that concentration and quality of outcome were particular indicators. Not only is this perceptive about their work and about classroom quality indicators but it might also be an indicator of how quality of outcome needs a considerable allowance of time, as Lee (Year 6) suggested earlier. Detachment was shown by the Year 6 pupils in the school being inspected when they were asked about whether they wanted to be an inspector. I wouldn’t want to be an inspector and shut down schools because the pupils need them. I wouldn’t want children to think that I was horrible and writing down negative things. You know you got me talking with that tape. I feel like I want to talk more and more often. I’ve enjoyed talking about all the subjects. It feels like I’m a hero now, ‘cos you talked to me. It feels like I’m a really popular person, it feels like I’m writing them down in a book, a book called ‘Andrew and Mr Jeffrey’, a book of art. The detachment, we suggest, is not necessarily that between the classroom experience and themselves, but between their total involvement and the ability to reflect and comment upon their involvement. Much that is here echoes some of the existing literature on pupil perspectives on ‘good’ teachers. It is perhaps unsurprising that pupils like teachers who are human, understanding, humorous, can explain, and make you work. But these pupils add a further gloss to this. We have summarized this under four main categories: firstly, making emotional connections through constructing a range of emotional situations conducive to learning, creating enthusiasm and excitement, dealing with anger and upsets, cultivating a close relationship and boosting confidence; secondly, through engaging interest by having ‘fun’, encouraging role-play, being resourceful and imaginative, giving pupils ideas, but all the while maintaining standards; thirdly, by maintaining pupils’ individuality through allowing them their preferred ways of working and to stamp their identity on their work, giving them ‘breathing space’, granting them status in discussions, respecting their views; fourthly, by encouraging pupils’ critical faculties through rational analysis and role detachment. By reflecting on their own reactions to these qualities, the pupils tell us something about their own metacognitive knowledge—about their knowledge of how they learn, and of shared understandings with teachers. But they also strongly suggest that creative teachers encourage creative learners. The same indicators of creativity are in evidence here with the pupils as were specified for the ‘creative’ teachers. Pupils are encouraged to be innovative, to have some control over their learning processes, and to make knowledge their own. It is interesting to see this applied to primary teachers and pupils working in the National Curriculum. Primary pedagogy has been a matter of great debate in the United Kingdom, especially since the publication of the Alexander, Rose and Woodhead discussion paper of 1992, and the accompanying media campaign, which seemed to some to presage a return to traditional teaching methods in primary classrooms (see Woods and Wenham, 1995). It would seem, however, that creative teaching and learning, at least amongst this group of teachers and pupils, is alive and well. Further, the manner of pupils’ reactions to their teachers is testimony to the relevance of their efforts. Looking at the pupils’ comments from this point of view, we can see that these teachers’ pedagogy is seen by pupils as having a direct bearing on their lives. Knowledge is integrated and privatized, as opposed to the public, commodity, alienated knowledge so often associated with institutionalized learning. So much of the National Curriculum, despite some benefits, seems to be of the latter kind, with its problems of overload, restriction of local adaptations, and formal, instrumental assessment (Campbell, 1993a, 1993b, Pollard, Broadfoot, Croll, Osborn and Abbott, 1994). These teachers, at least, are proving adaptable; not ‘becoming slaves to the National Curriculum’, but rather ‘appropriating’ it for the agendas they judge most pertinent for their students’ concerns (Woods, 1995a). It is not enough, however, simply to be relevant. Relevance has to be demonstrated and achieved. Students have to know and feel the relevance themselves. Their comments here tell us how their teachers achieve this through emotional connections, engaging interest, encouraging individuality, and developing critical faculties. In this, we might see some of the properties of what Clayden, Desforges, Mills and Rawson (1994, p. 172) describe as ‘authentic activity’, involving ‘putting the pupil into the engine room, as it were, of knowledge creation’ (see also Bridges, 1991). There are, further, elements of the ‘socially critical primary school’ as argued for by Morrison (1989), sustained by a form of progressivism based on ‘creative thinking, self-awareness, and inner strength’ (Zimiles, 1987, p. 204). This involves a holistic view of pupils, viewing them as rational agents, but taking into account ‘all their capacities—“emotion” and “will” as well as intellect’ (Quicke and Winter, 1993, p. 2). Beyond this, what enables these teachers to continue being creative while so many of their colleagues elsewhere feel under pressure simply to survive (Woods, 1995b)? Personal factors clearly play a large part, such as commitment, values and beliefs, experience, life history, personal qualities (for example, skill, knowledge, degrees of care); but there are strong support factors also, in the form of headteacher, colleagues, school culture and history generally, governors, parents—and also pupils. These are difficult times for teachers but, throughout, the responses and support of their pupils, as illustrated in this article, are their main reward and inspiration. 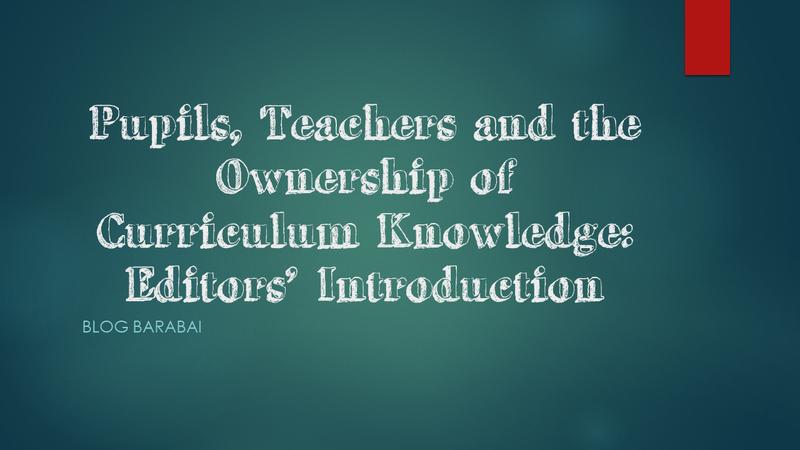 0 Response to "Pupils, Teachers and the Ownership of Curriculum Knowledge: Editors’ Introduction "